F3 statistics are used for two purposes: i) as a test whether a target population (C) is admixed between two source populations (A and B), and ii) to measure shared drift between two test populations (A and B) from an outgroup (C). Here, \(\langle\cdot\rangle\) denotes the average over all genotyped sites, and \(a, b\) and \(c\) denote the allele frequency for a given site in the three populations \(A, B\) and \(C\). Intuitively, an F3 statistics becomes negative if the allele frequency of the target population (C) is on average intermediate between the allele frequencies of A and B. 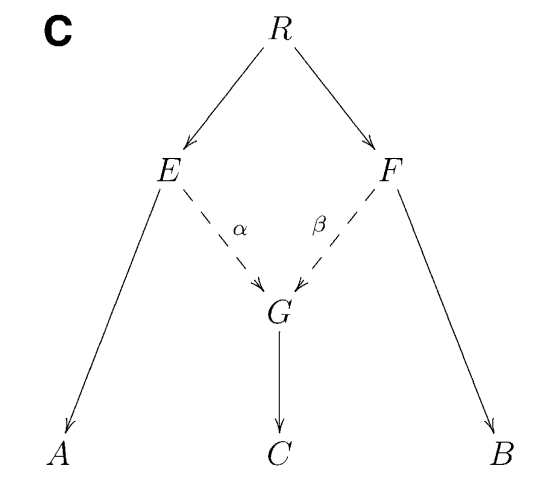 Consider as an extreme example a genomic site where \(a=0, b=1\) and \(c=0.5\). Then we have \((c-a)(c-b)=-0.25\), which is negative. So if the entire statistics is negative, it suggests that in many positions, the allele frequency \(c\) is indeed intermediate, suggesting admixture between the two sources. 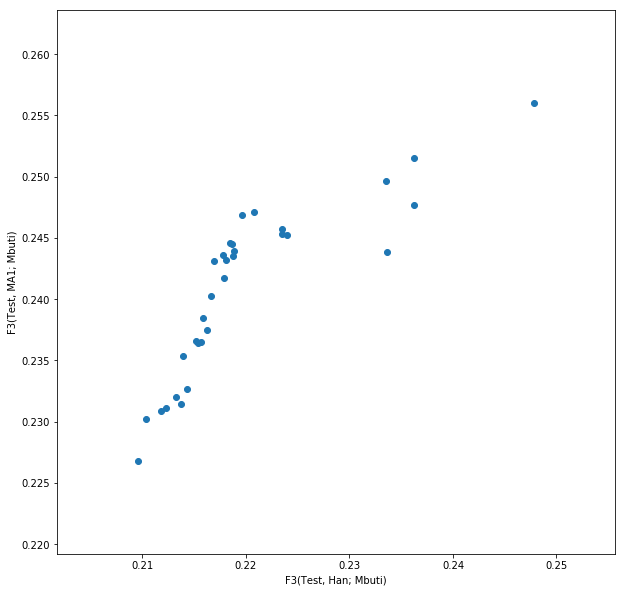 If an F3 statistics is not negative, it does not proof that there is no admixture! We will use this statistics to test if Finnish are admixed between East and West, using different Eastern and Western sources. In the West, we use French, Icelandic, Lithuanian and Norwegian as source, and in the East we use Nganasan and one of the populations analysed in this workshop, Bolshoy Oleni Ostrov, a 3,500 year old group from the Northern Russian Kola-peninsula. popfilename:    a file containing rows with three populations on each line A, B and C.
Here, the last option is necessary if we are analysing pseudo-diploid ancient data (which is the case here). Prepare the parameter file with the input data as in the PCA session (see Principal Components Analysis (PCA)) and then run qp3Pop -p PARAMETER_FILE, where PARAMETERFILE should be replaced by your parameter file name. This will take about 3 minutes (see the ~/share/solutions/bash_commands notebook if you need a hint). This output shows as first three columns the three populations A, B (sources) and C (target). Then the f3 statistics, which is negative in all cases tested here, a standard error, a Z score and the number of SNPs involved in the statistics. The Z score is key: It gives the deviation of the f3 statistic from zero in units of the standard error. As general rule, a Z score of -3 or more suggests a significant rejection of the Null hypothesis that the statistic is not negative. In this case, all of the statistics are significantly negative, proving that Finnish have ancestral admixture of East and West Eurasian ancestry. Note that the statistics does not suggest when this admixture happened! A different way to test for admixture is by “F4 statistics” (or “D statistics” which is very similar), also introduced in Patterson 2012. 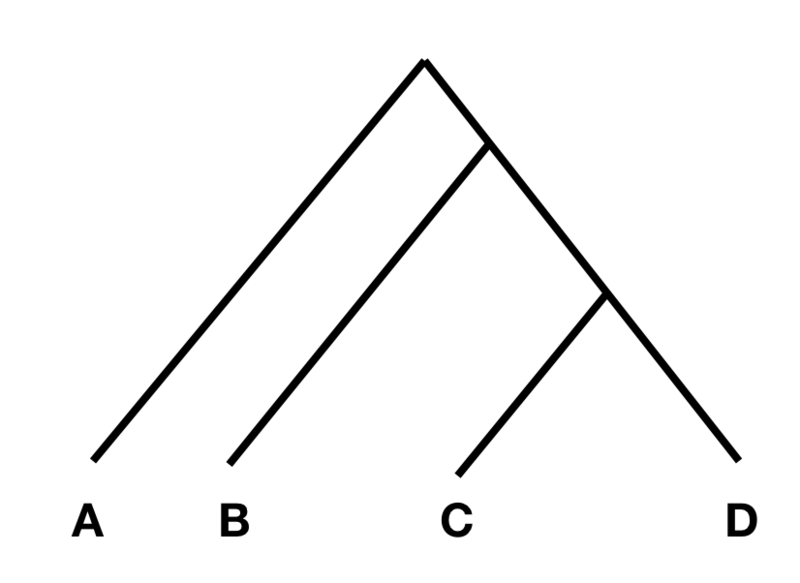 In this tree, without any additional admixture, the allele frequency difference between A and B should be completely independent from the allele frequency difference between C and D. In that case, F4(A, B; C, D) should be zero, or at least not statistically different from zero. However, if there was gene flow from C or D into A or B, the statistic should be different from zero. Specifically, if the statistic is significantly negative, it implies gene flow between either C and B, or D and A. If it is significantly positive, it implies gene flow between A and C, or B and D.
The way this statistic is often used, is to put a divergent outgroup as population A, for which we know for sure that there was no admixture into either C or D. With this setup, we can then test for gene flow between B and D (if the statistic is positive), or B and C (if it is negative). Note that you cannot give the “inbreed” option here. Prepare the parameter file as suggested above and then run qpDstat -p PARAMETER_FILE, where PARAMETERFILE should be replaced by your parameter file name. This will take about 3 minutes (see the ~/share/solutions/bash_commands notebook if you need a hint). Here, the key columns are columns 2, 3, 4 and 5, denoting A, B, C and D, and column 6 and 7, which denote the F4 statistic and the Z score, measuring significance in difference from zero. 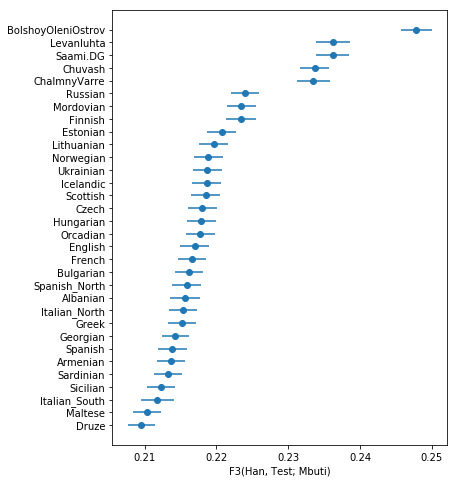 As you can see, in all cases, the Z score is positive and larger than 3, indicating a significant deviation from zero, and implying gene flow between Nganasan and Finnish, and BolshoyOleniOstrov and Finnish, when compared to French, Icelandic, Lithuanian or Norwegian. Outgroup F3 statistics are a special case how to use F3 statistics. The definition is the same as for Admixture F3 statistics, but instead of a target C and two source populations A and B, one now gives an outgroup C and two test populations A and B. 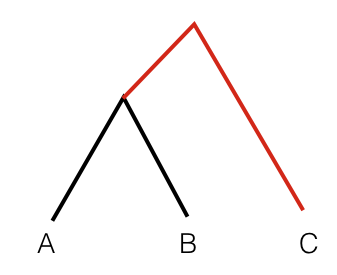 In this scenario, the statistic F3(A, B; C) measures the branch length from C to the common ancestor of A and B, coloured red. So this statistic is simply a measure of how closely two population A and B are related with each other, as measured from a distant outgroup. It is thus a similarity measure: The higher the statistic, the more genetically similar A and B are to one another. 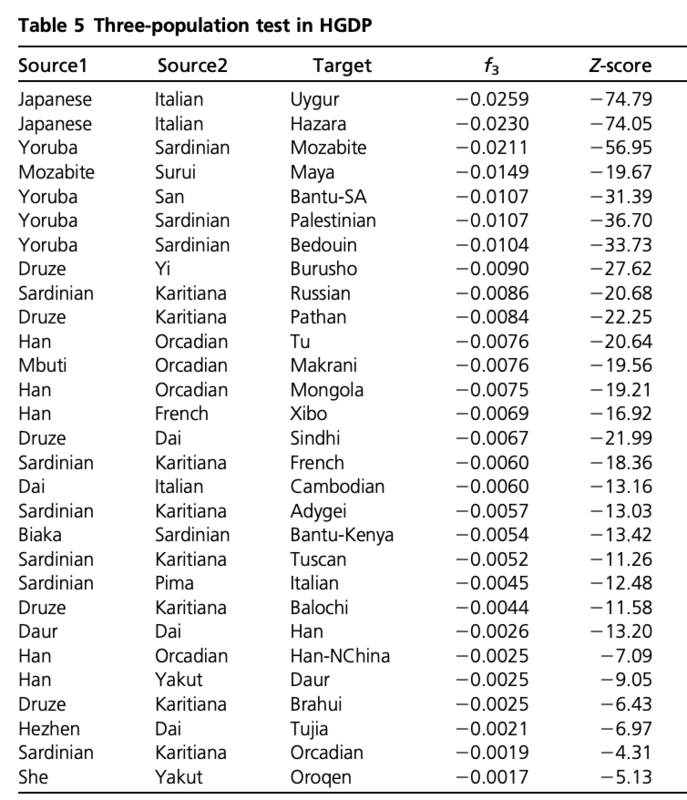 We can use this statistic to measure for example the the genetic affinity to East Asia, by performing the statistic F3(Han, X; Mbuti), where Mbuti is a distant African population and acts as outgroup here, Han denote Han Chinese, and X denotes various European populations that we want to test. which cycles through many populations from Europe, including the ancient individuals from Chalmny Varre, Bolshoy Oleni Ostrov and Levänluhta. Copy this list into a file, and prepare a parameter file for running qp3Pop, similar to the parameter file for admixture F3 statistics above, and run qp3Pop with that parameter file as above. Now it’s time to plot these results using python. Copy the results (all lines from the output beginning with “results:”) into a text file, open a Jupyter python3 notebook and load the text file into a pandas dataframe, using pd.read_csv(FILENAME, delim_whitespace=True, names=["dummy", "A", "B", "C", "F3", "StdErr", "Z", "SNPS"]. View the resulting dataframe and make sure it looks correct. Use the above code snippet to plot the Outgroup F3 data. Google the errorbar and yticks functions from matplotlib if you want to know how they works. 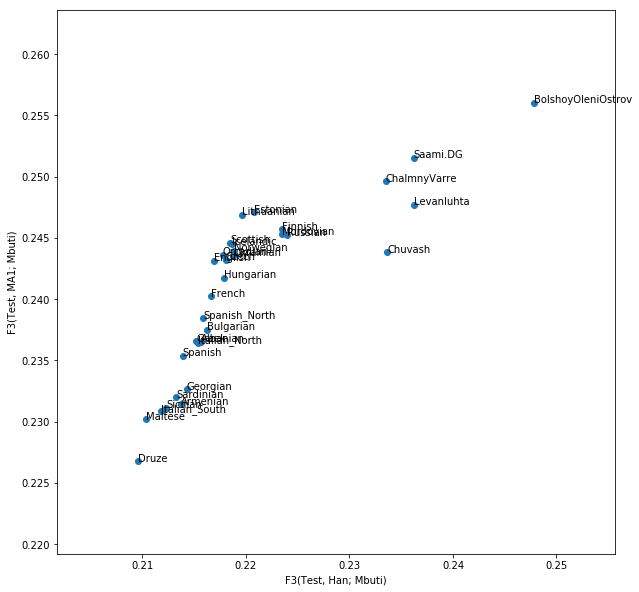 showing that, as expected, The ancient samples and modern Saami are most closely related to modern East Asians (as represented by Han) compared to many other Europeans. There are many interesting results here, but one of the most striking one is the finding of F3(Sardinian, Karitiana; French), which is highly significantly negative. This statistics implies that French are admixed between Sardinians and Karitiana, a Native American population from Brazil. How is that possible? We can of course rule out any recent Native American backflow into Europe. As you can see, the idea is that modern Central Europeans, such as French, are admixed between Southern Europeans (Sardinians) and ANE. The Ancient North Eurasians are a classic example for a “Ghost” population, a population which does not exist anymore in unmixed form, and from which we have no direct individual representative. Amazingly, two years after the publication of Patterson 2012, the ANE ghost population was actually found: Raghavan et al. and colleagues, in 2014, published a paper called “Upper Palaeolithic Siberian genome reveals dual ancestry of Native Americans”. 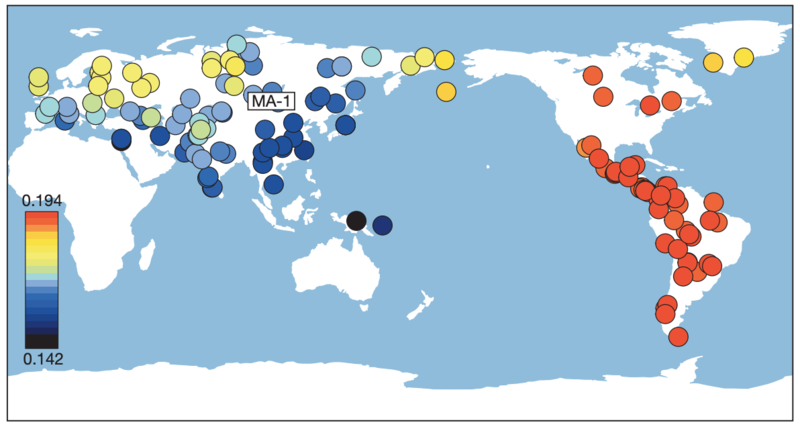 A 24,000 year old boy (called MA1) from the site of “Mal’ta” in Siberia was shown to have close genetic affinity with both Europeans and in particular Native Americans, just as proposed in Patterson 2012.
where MA1_HG.SG is the cryptic name for the MA1 genome from Raghavan et al.. Follow the same protocol as above: Copy the list into a file, prepare a parameter file for qp3Pop with that population triple list, and run qp3Pop. Copy the results (all lines beginning with “results:”) into a file and load it into python via pd.read_csv(). run the above merge command and check that it worked by viewing the resulting dataframe. Create this plot with the code snippets above. The result shows that indeed the affinity to East Asians in the bulk of European contries can be explained by MA1-related ancestry. Most European countries have a linear relationship between their affinity to Han and their affinity to MA1. However, this is not true for our ancient samples from Fennoscandia and for modern Saami and Chuvash, who have extra affinity to Han not explained by MA1 (Lazaridis et al. 2014).